How Patriotic Should Christians Be? Does this not seem strange to anyone else? When did Christians become okay with giving more honor to the flag that represents the country they live in than to the flag representing the God we serve? I’m not a fan of having the United States flag anywhere inside the church, but if you insist on having it in your church, could you at least put it in its proper place? I realize that flags are just pieces of fabric, but when you display a flag you are expressing your loyalty to whatever that flag represents. And the flag that you place in the position of prominence and highest honor tells everyone who you are most loyal to. It drives me nuts when I go into a church or Christian organization and I see the United States flag displayed, especially when it is above the Christian flag or the Christian flag is not present. By doing this it tells people that your ultimate loyalty is to the United States. Our loyalty should not be to any country, state, organization, or system, but to God and God alone. That is why I have issues with flying the United States flag inside church buildings. It’s also why I struggle with saying the Pledge Of Allegiance. I guess my biggest issue with all this is whether or not it’s possible to profess allegiance and be loyal to both God and the country I live in. My ultimate loyalty will always be to God, but loyalty to a country can change. If I were a citizen of Djibouti, would my loyalty and allegiance be to America or Djibouti? I would probably be okay with pledging my allegiance to the United States above any other country, since it’s where I was born and where I live, but I’m not okay with pledging my allegiance in general to a flag or a country. I don’t know if you’ve ever experienced this, but not too long ago I was at a function at a church and they had everyone stand up and say the Pledge of Allegiance. I just couldn’t wrap my head around how they could think that it seemed like a good idea. It was at a graduation ceremony for a preschool at a church in town and they had the kids singing church songs and patriotic songs, one right after the other. When did American patriotism become so intertwined with Christianity in this country? And why do Christians seem so okay with them being so closely bound and get so upset and defensive when other people aren’t as patriotic as they think they should be? Please don’t misunderstand – I’m not saying that we shouldn’t be appreciative of the rights and freedom that we have as a result of living in America. We should appreciate and be thankful for the rights and freedom that we are afforded as a result of living where we do. We should be thankful for, respect, and honor those in the military and public service who have sacrificed their time, effort, energy, and lives to protect us and our freedom. We should show a certain amount of respect to the flag and what it represents. What we shouldn’t do is be more devoted to the country in which we live than to the Kingdom to which we belong. Be patriotic if you want. Be appreciative and grateful that you live where you do. Show respect to the country, the flag, and those who have given so much so that you may have something to respect and be appreciative of. Just don’t forget that God and His Church must take priority over whatever country, state, or city you live in. Nations will come and go, but the Kingdom of God will reign forever. ← Previous Post What Were They Thinking? i quite enjoyed this tim. thanks. Thanks Sarah! Hope you guys are doing well – you’re all in our thoughts and prayers. News flash. Church and state are already divided. But Christians seem to forget that when they lobby for the ten commandments to be displayed outside of courthouses and for God to still be present in the pledge of allegiance. Or when the issue of gay marriage or abortion come to light Christians are more than happy to demand that their beliefs take precedence to civil rights. I wholeheartedly believe that they should remain separated because the children of our public school systems should not be subjected to your beliefs. Remember that the next time you argue for intelligent design being taught in public schools or for religious holidays being celebrated and observed. The founders of this country were deists yet Christians still hold a large majority of lobbying efforts in Washington and demand that candidates for office display their religious beliefs in order to obtain the Christian vote. Disgusting. 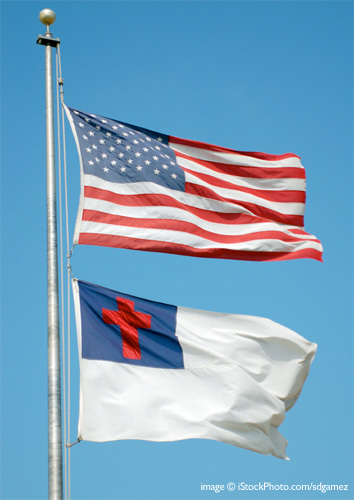 Take the flag out of your churches and stay out of politics and the public forums as well. I agree with you that it’s a good thing that the Church and state are divided. I don’t think that a government should be run by a particular church or religion and I don’t think that a church should be influenced by the government of the country it’s in. This country was founded with the intent that everyone would be free to practice whatever religion they chose to follow. Christianity happens to be one of those religions, but America wasn’t founded so that every person would be a Christian. Not every single founder of the country were Christians. Some were Theists, some were Deists (as you said), some were probably Atheists. I don’t know the beliefs of every single founding father, but I know that their beliefs were varied. I also agree with you that there are some Christians who can get pretty crazy and ridiculous. It’s really an embarrassment and a misrepresentation of true Christianity. I am a Christian and am not embarrassed or ashamed of what I believe, but it drives me crazy when I see and hear about some of the things that Christians do. I think that any reasonable person (whether you believe in God or not) would agree that following most of the Ten Commandments would be a good idea. I think we can all agree that if we respect others and don’t lie, steal, kill, or cheat on our spouses it would have a positive impact on the world. That said, I don’t think the Ten Commandments should be posted in or around a courthouse. I’m guessing if there was something from the Islamic or Mormon faith in the courtroom, Christians would have a huge fit about it. When it comes to public schools, I agree with you there as well. I think that religion and public education should be two separate entities as well. Public schools should teach only facts, not opinions and beliefs of a particular group. As far as the creation/evolution debate, I personally would be okay with them teaching what both sides believe. I do believe that God created everything and I don’t think there is proof that the world just happened into existence or that we evolved from monkeys, but apart from faith in one system or another it’s impossible to have the proof necessary to convince a person either way. I think that if parents want their children to be taught certain things, it’s up to the parents to teach their kids. One of the problems with our country is that we have a bunch of lazy parents who expect other people to raise their kids for them and don’t take the time to teach them, spend time with them, or care about them. Then they complain when their kids are out of control, rebellious, and always in trouble. As far as particular issues like gay rights and abortion – of course a person’s personal beliefs are going to influence the way they view the issue. Christians aren’t the only ones that try to convince everyone else that their way is the right way. I do think that Christians have said and done a lot of stupid stuff when it comes to those two particular issues though. It seems as though a lot of Christians think that people who aren’t Christians need to have the same beliefs as they do, which is just dumb. They tend to forget that the two things that Jesus said were most important were to love God and love your neighbor. They claim to love God, but then turn around and act hateful toward people who don’t believe the same things they do. They also tend to get very judgmental toward those who aren’t Christians, even though they have no right to be. Christians aren’t called to judge non-Christians, they are supposed to love them, serve them, and share the good news of God’s grace, love, and mercy with them. Too often Christians get caught up in arguing over minor issues and some really stupid stuff. Like I said, I am a Christian and make no apology or excuses for it. I’m sure that, like anyone else, you’ve probably come across a lot mixed-up, crazy, and just plain weird Christians. If you’ve been hurt or mistreated by Christians in the past, I want to apologize for that. I won’t make excuses for them – they were wrong. Please don’t judge or discount God because of some crazy people who have done stupid things. We are all screwed up. We don’t do a very good job of it a lot of times, but Christians are supposed to show love to those who are hurting, broken, and hopeless – not fight over moral issues. God loves gays, lesbians, and those who have had or are contemplating abortions just as much as anyone else. In fact, there are Christians who struggle with their sexuality and whether it’s right or wrong to feel the way they do and there are Christians who have had abortions. The simple truth is that we are all screwed up and we all have issues. I really appreciate your comment and your honesty. I know that some people just want everyone to agree with them and pat them on the back in their comments section, but in my opinion a good, honest discussion is so much better. Not everyone believes the same things and it’s good to see what others believe and have to say. Just remember that, as cliche as it may sound, God loves you and desires to have a relationship with you. I don’t know if you’d be interested, but you should check out Matthew Paul Turner’s blog. It’s called Jesus Needs New PR. He is a Christian, but is very open and honest and points out a lot of the stupid stuff that Christians do. Definitely worth a read. Tim I think you have the right idea. It is so refreshing to hear someone who focuses on the love that Jesus was aiming for and not the negativity or the discourse that is often spread. You are a very openminded Christian and I appreciate your comments. I believe that Jesus was a man who lived and spread love in all that he did even if I don’t believe that he was the son of God. But I am enjoying your blog on a different level. You have a lot of love in your heart and that is the foundation of your beliefs. Unlike some others of your faith, the tenants are good and true. Kudos to that. Also, yes everyone can benefit from the ten commandments just like we benefit from the golden rule. Though I am an atheist I live my life in a way that only serves others and hopefully spreads good vibes whereever I go. Thanks Cari – I appreciate the kind words. What’s funny is that even though you are an atheist, by serving others and spreading good vibes, you are living more like a Christian than a lot of Christians. Obviously there are some pretty big pieces missing like the whole belief in God part, but as far as lifestyle goes, you’ve got it right. It makes me so angry when I see and hear some of the things that Christians do and say. I think a lot of times Christians are narrow-minded and self-centered and they tend to focus on not ever doing anything wrong and following a bunch of rules, when that’s not what Christianity is about at all. I must say, though, that for all the Christians that get it wrong, there are just as many that get it right. The dumb ones just seem to be the loudest. Not to start a big religious debate or anything, but why is it that you don’t believe in God or that Jesus is the Son of God? I’m always curious to find out what exactly keeps people from believing. Don’t worry, I don’t intend to argue with you or try to force you to believe something that you don’t believe – that’s just pointless and stupid. I am willing to try to help you find answers to any doubts or questions you might have though. I won’t pretend to know all the answers, but I’m always open for discussion and helping you find answers to your questions. Thanks again for reading and for your honest comments. Excellent post. Gregory Boyd’s book “The Myth of a Christian Nation” really put me over the edge on this topic. Welcome to Colorado, by the way, just found your blog through twitter. Thanks Jay! Don’t happen to know of any decent jobs in the area do you?